Lieutenant-General (Ret.)D. Michael Day CMM, MSC, CD – President of the PPCLI Foundation joined the Canadian Forces in 1983 and has commanded at every level and rank in a variety of units and deployments around the world. The majority of his field and command time has been as an Operator within Canada's Counter Terrorist and Special Forces community, commanding Joint Task Force Two (JTF2), Canada's Special Operations Forces Command, as well as a variety of other command assignments. 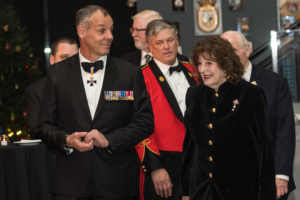 He also served as the Senior Uniformed Officer in the Defence Policy Group and as Chief Strategic Planner for the Canadian Armed Forces and Department of National Defence, as well as Commander of Canada's National Special Forces Command. Additionally, he served as a NATO Commander in Afghanistan and was responsible for the training and certification of NATO's Response Force. The 100th anniversary Commemoration provided the Foundation a focus for raising funds and meeting the goals of assisting the wounded, the fallen and their families that continued into 2015. The closing of the Anniversary in May of the year was highlighted with the Return to Europe and Frezenberg Commemoration. The Youth Education Program was a great success and serves as a model of cooperation between the Regiment, the Association and the Foundation in providing a unique experience for the youth who attended. We are grateful for and offer our thanks to Heritage Canada, PPCLI Cadet Corps and individual donors for their generous funding support. We are here to support the the Soldier, the Wounded, the Fallen and their families no matter where they might have served. As Canadians, we owe a great and ongoing obligation to the families of the fallen and to those wounded in the service of Canada; those who often endure the scars of battle long after they have left the field. An understanding of Canada's history and heritage is a key component of our future as individual Canadians and as a nation.